The error, Ethernet doesn’t have a valid IP configuration occurs when it could not obtain a valid IP from your DHCP server. The IP and other details are obtained by your network connection is a default process. But because of some reasons, your Ethernet connection can’t get the essential details. This results in the blocks all the connections on your computer from reaching the DHCP server. Due to this, you might get some annoying errors like as no internet access or limited connectivity. There is nothing to worry much about it. It is a software-related problem and isn’t permanent. You can easily get rid of it. Here we will give a few handy ways that can be used to get rid of this Ethernet doesn’t have a valid IP configuration error. There are several reasons for the cause of this Internet connection error. Some of them are the incorrect configuration in the network adapter, expired cache files, cable issues, DHCP issues, or even may be due to a faulty network driver. Right-click on the Windows icon present at the bottom left corner of the taskbar and select Command Prompt (Admin). Type the following command in the command window and click enter. Restart your PC to apply these changes. Now again open the Command Prompt (Admin) and enter the following commands and select enter. Reboot the system to save changes. 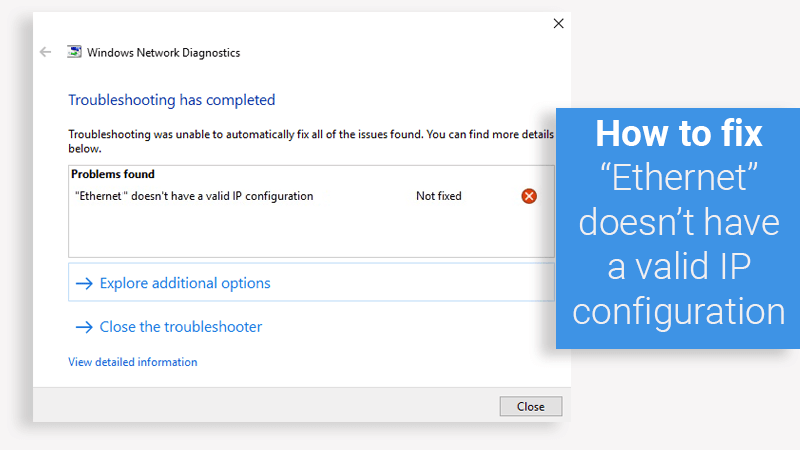 This method will fix the Ethernet doesn’t have a valid IP configuration error. If in case it still exists then try the below methods. Press the Windows key+R to open the Run tab. Then type ncpa.cpl and press enter. Right-click on the NIC that is facing the issue and select Disable. Again Right-click on the NIC, this time Enable it. Do this after a few minutes. Wait till it receives an IP address successfully. Check whether the issue is fixed or not. If it still persists type the following commands in the command window and press enter. Restart your system to save changes and check whether the Ethernet doesn’t have a valid IP configuration error is fixed. That’s it now you can fix the Ethernet doesn’t have a valid IP configuration error. We have mentioned a few working methods to solve this error. There are many more methods to fix it, but we mention the easy and working ones. So try it out… Hope this will be useful and informative. For any queries and suggestion, contact us or comment below.